The NZ entertainment industry came together in support of the families of the victims of the Christchurch massacre by putting on a Gala Variety Show in Auckland last Sunday 7th April. All of us were united, both on and off stage, in front and behind the camera, doing what we do best, to make a difference for everyone impacted by this horrific attack. It was a real old-school variety extravaganza, combining clever comedy with magnificent musical acts, and every cent went to the victim support’s Givealittle page. There was no budget other than people’s time, talent and resources. For the concert I broke a rule I now have, which is not to sing the same day if I’ve just flown longer than 8 hours. You see, I’ve walked off short haul or Trans-Atlantic flights a fair bit in my time, straight to gigs, and fortunately most times I’ve been lucky. But there was definitely one time in recent years where I majorly failed. The cabin air is less than 20% humidity which has a drying effect on nasal passages and throats, completely drying up your voice, playing havoc with your vocal folds. Long haul flights sound the death knell. Last week I’d been performing with Incognito Artists for a client/friend in Dubai. I was on the plane ready to take off to NZ, and then we stopped, taxied back to the terminal, disembarked and I had to sit around for six hours. I was worrying if would be even further delays and I wouldn’t make it to the concert in NZ. Then I got back on the plane, flew 16 hours to Auckland, got out of the airport as fast as I could and drove straight to Skycity Theatre. After all that, I truly didn’t know if anything tuneful would come out when I opened my mouth in the quick sound check, let alone when I was on stage during my closing slot at 11pm, six hours later. I feared a lovely, big crack on a high note, in humiliating style, in front of family, friends and Kiwi legends, and an unforgiving TV audience. But I showed up and gave it my all, regardless, because I knew better than to listen to fear talking; there were far more important things to focus on. I trusted in something bigger than me, to ensure I did my best heart-centred performance for Christchurch. And as fate would have it, it ended up feeling like an out-of-body experience, watching myself perform and a voice appeared, when it needed to. My daughter Sienna (15) had been rehearsing her school production all day, finishing at 6pm. 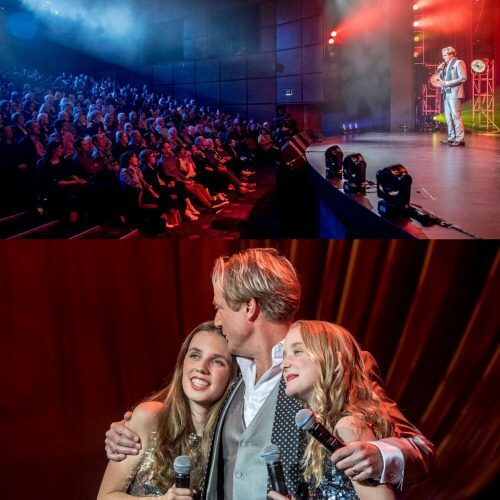 She also raced to Skycity to do her mic check before the house opened at 7:45pm and then waited patiently until 11pm to perform with me and her younger sister Olivia (13). The cause was so significant and unifying; there was no thought of ‘I’m too tired’. We knew we were blessed to be there, blessed to be alive, and honoured to do whatever we could for the victims and their families. Everyone was there for free, with the purest of intentions, wanting to help, unite, be of service, make people laugh and cry, and be entertained. It’s been evident across NZ and the world that we don’t want to dwell on the fear, hate, and division highlighted on 15th March – which tore Christchurch and the wider NZ community apart, and stole New Zealand’s innocence. At this concert and around the world we choose to remember our humanity and similarities; let’s be inclusive, accepting, proactive and, as Oprah said this week, ‘Brimming with hope’.